For the wine lover, a tour through the vineyards of southern France is at once magically full of life and a sense of wonder, and somehow rather sad. For every row of immaculately maintained, gnarled old vines, sits a straggling unkempt field. For every bustling village, with the Bar des Sports and the Boulanger doing brisk and friendly business, are rather forlorn hamlets with shuttered windows, peeling paint and little sign of life beyond the town’s top dog lazily scratching in warmth of the sun. The south is the great homeland of the French cooperative: the mutually-owned winemaking organisation with hundreds, sometimes thousands of small farmers and vignerons as members. 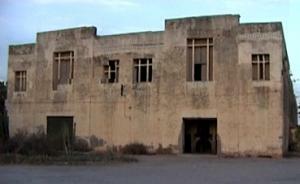 The once proud cooperative buildings sit at the heart of the village, run by obstinate committees, often riven by jealousies and the smouldering embers of old feuds and disputes. Concrete brutalist bunkers from the 1930’s, they are filled with cement tanks, antiquated presses and dingy offices. Often, they sit empty, with minimum investment over the decades taking its toll until the modern wine world simply passes them by. In one of the wildest and most remote corners of France, Fitou seems to fit this bill perfectly at first. Just a little further from the Mediterranean coast and main centres than the more popular tourist roads of the Languedoc lies this land of breathtaking beauty, where the Corbières mountains are thick with forests at the upper levels – a paradise for hunters of Sanglier (wild boar) – and the lower slopes are carpeted with vineyards running down to the valley floor. Ancient Carignan and Grenache bush vines lie in undulating creases and folds, their trunks as thick as your thigh, hanging heavy with vivid purple/black bunches of grapes, on dry, schisty soils strewn with rock and sheets of slate. This is beautiful vineyard country, and quintessential peasant farm land. Former inhabitants have built themselves smart new detached houses with pools and all mod cons outside the village. In some, houses are being restored and brought back to life mostly by the British, with as much as 50% of some villages now composed of weekend and holiday retreats for London city types. But that still leaves them empty most of the time. On the wine roads around Fitou you will see the abandoned shells of old coop buildings, looking for all the world as though all hope is lost for the area as a wine producing force. Fitou, without the glamour of some neighbouring areas in the Languedoc and Provence, was mostly the cheap and rather rough stuff that offered plenty of bangs per buck, but little to tempt the modern palate. But for all the outward appearances of a region gently in decline, Fitou beats with a surprisingly youthful and vibrant heart. Ten years ago some radical surgery – ground-breaking in its way – took the moribund cooperatives of the region by the scruff of the neck and shook some life into them. This is the home of the cooperative of Mont Tauch, responsible for some of the best – and best value – wines of the Languedoc Roussilon. Mont Tauch’s wines are able to win places on the shelves of most high street retailers in the UK, at price points heading into the teens. Labels like “Les Douze” from twelve of the best cooperative members, or the bright and breezy Terra Vitis, made using the environmentally aware techniques of Lutte Raisonée, are popular brands in their own right, competing successfully with the most slickly-marketed and biggest budget names of the New World. I visited Mont Tauch in late Autumn 2004, with a very successful harvest already in the bag, and the vineyards, glorious in shades of red, yellow and copper, bathed in warming sun that took the edge off a chilly wind. Head winemaker at Mont Tauch is Michel Marty (right), a direct, no-nonsense local who has run the winery with authority and passion for over a decade – as he must with over 300 member vignerons depending on his skills to bring them their next paycheck. For 10 years Mont Tauch as invested heavily in both its winery and in the vineyards of its members. The array of stainless steel tanks glistens in the sun, and laboratory, technical tasting rooms and busy offices hum with life. Though it was established almost one hundred years ago, Mont Tauch is all about modernisation and – for the region – a very new approach to quality. Not only have the vineyards and winery been subjected to a soul-searching and sometimes painful re-evaluation, but the very fabric of the cooperative movement has been ripped apart and re-engineered. Whilst traditionally the 300-odd vigneron members were paid on the quantity of grapes they could contribute, now payments – and penalties – are firmly fixed to quality. In the early 1990’s the Coop was in a parlous state, with a typically hide-bound structure, over-cropped vineyards and ageing winery plant. But in 1998 a new regime took over, headed by the more dynamic members of the Coop. A 15-member “Vineyard Committee” was established, charged with raising the quality of the vineyards and identification of sites and soil-types most suitable for each grape variety. Growers now opt in to one of several contracts, each of which sets higher standards, but promises potentially greater rewards. To qualify for the top contract payments, grapes must be in top condition. Over 40 parameters are analysed in the labs for every load of grapes delivered. Part of the huge investment the Coop has made (£15 million in the past decade) is to fill the winery with small stainless steel tanks – hundreds of them – giving the capacity to make sure each vigneron’s produce is vinified and tasted separately. Each member is paid strictly on the quality of the finished wine made from his or her grapes, and penalties and declassification is rigorously enforced. For the top “Grand Cru” level, only around 25% of grapes submitted make it through the system without declassification. Clearly this regime rewards the best growers, and from the several that I met, there was huge enthusiasm and pride. 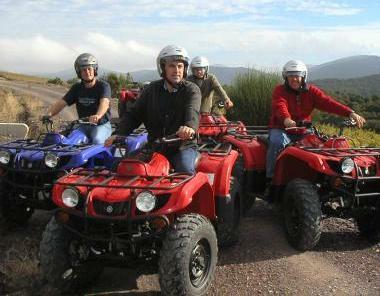 (right, four of the vignerons on our day in the vineyards). The competition each year to be one of the dozen who’s face appears on the label of “Les Douze” is intense, and is taken very seriously indeed. But as well as staying on top of quality of grapes and winemaking, the Coop has also been alive to the needs and expectations of today’s global wine consumers. Packaging, logistics and marketing have all been addressed, including the employment of English-born Katie Jones as Export Director, one of the most dynamic and bubbly personalities I have met on the wine scene, and a shrewd marketeer for the coop’s various labels. Mont Tauch accounts for six out of every 10 bottles of Fitou consumed in the UK. The glory here is Carignan, huge parcels of which are on 60-year-old, naturally low-yielding vines. 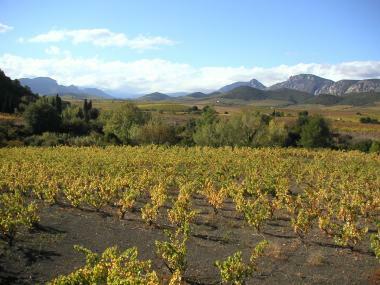 Grenache, Syrah, Mourvèdre as well as Cabernet Sauvignon and Merlot are also planted, but it is the Garignan that here – arguably of all places on the planet – does best. The deep, rich, boldly-fruited but fresh wines are the back-bone of most of Mont Tauch’s most popular blends. I took part in a little blending experiment, where I had to make the best wine I could from individual component grapes. Whilst the Grenache was earthy and nutty, and the Syrah pure and sweet, it was the Carignan that clearly seemed to express this terroir best. An interesting development is recent plantings of Marselan, a new grape created in 1994 from a crossing of Cabernet Sauvignon and Grenache. After initial experimental plantings, Mont Tauch now has 11 hectares planted, which will rise to 20 over the next couple of years. Marselan forms with large bunches of very small grapes, so has a good ratio of skin to juice, and it ripens early. Mont Tauch will release their first varietal Marselan from the 2004 vintage, and the sample I tasted was vividly black-fruited, with excellent aromatics and a substantial, fruit-packed and spicy palate. A small run down of some of Mont Tauch’s finest follows. Like the Cellers de Capçanes (Mas Collet) in Spain, or La Chablisienne in France, it is a wonderful thing to find a big cooperative that is producing not only reliably good wines, but some great wines that punch every ounce of their weight and more. This wine blends 50% Carignan with 45% Grenache and 5% Syrah. It has bright, slightly minty, keen raspberry fruit on the nose with a creamy quality and a hint of herbs and briar. The fruit on the palate is forward and precise, with cherry and more of that creamy raspberry, and a nicely bitter edge. Quite chewy and dense through the mid palate, this offers a lot at the price, finishing thick and powerful. Very good indeed. This wine comes from vineyards which follow the practice of “Lutte Raisonée”, a form or agriculture which respects the environment. It is a blend of Carignan, Syrah and Grenache. The nose is creamy, warm and gently spicy, with copious berries and a little hint of old roses. On the palate there’s a raft of broad, soft, drying tannin that supports beautifully sweet, ripe cherry and berry fruit. Balanced and long, this is a lovely little red with savoury, food-friendly appeal. Very good indeed. This blend of Carignan, Grenache, Mourvèdre and Syrah is aged in oak, and has a big, plummy, baked plum pie nose, with spice and depth, but also a hint of kirsch-like brightness. The palate is smooth and has a slick of vanilla over cherry fruit and a biting, damson darkness. There are lovely tannins and a tart cherry acidity into the finish. Very good indeed/excellent. The blend here is 40% Carignan with 35% Grenache and 25% Syrah all from low-yielding vines, most over 50-years old. There is a big layer of a creamy, slightly leathery aroma on the nose, but beneath is core of dense, solidly-packed red and dried fruit. On the palate it is at first bright and racy, but then a big rustic sweep of rasping, plummy fruit and grippy tannins fills the mouth, Dense and structured, with a liquorice edge and cherry acidity, this is a big mouthful of wine that is long and powerful. Very good indeed. There is a much more mineral and schisty aspect to this wine, perhaps due to it’s 60% Syrah, 40% Carignan blend. 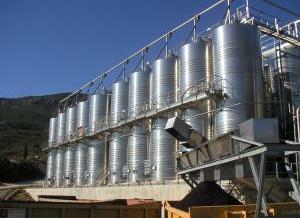 The Syrah component also spends between 9 and 12 months in barrel. The fruit is quite lean and dry, with a raspberry character. The palate is very tight and muscular, with a deep-set core of creamy black fruits and a fine, concentrated finish. Tannins are polished, and there is good length in this wine. Very good indeed. For this wine (40% Syrah, 40% old-vine Grenache, 20% old-vine Carignan) the Syrah spends one year in new barrels, whilst the Carignan spends one year in second-fill barrels. This has an immediately bold and powerful nose, and though there’s an edge of mineral and red cherry, the suggestion is of a supple, fleshy wine. There’s a fine chocolaty aspect in the mouth, with really sweet blackcurrant and blueberry fruit. The polished tannins and fresh acidity add elegance to a long finish. Excellent. This wine comes from selected vineyards around the village of Paziols, and is made from 55% Carignan, with 30% Grenache and 15% Syrah. The Syrah sees new oak, the other grapes spend one year in older barrels. This has a much meatier, more animal character with a bloody, gamy perfume and rounded, robust plum fruit. There’s a much more earthy and rustic power to this wine, with masses of beefy, rich fruit and powerhouse tannins. Very good indeed. 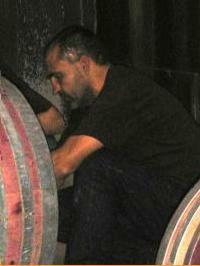 This wine is Michel Marty’s selection of his best Syrah (80%) and old vines Carignan and Grenache, aged in barriques. Michel reckons it will mature for 10 years in bottle. It has a thick, slightly reduced nose, but it is loaded with dark, briary, thick black fruits, a little dusty quality and herbal notes. The oak is still quite marzipanny and raw. There’s a creamy edge to solid berry fruit on the plate, bitter dark chocolate and a fine edge of tannin and acidity. Very impressive wine that might well be better with a few years in bottle. See all stockists of Mont Tauch on wine-searcher.